Mark “Westcoast” Comerford: Guitar & Percussion, Vocals and Big Hank Lionhart: Lead Vocals. Mark and Hank are both members of Uncle Willys Hot Shoes Blues Band Although the Blue Hearts is a new thing for them they bring a ton of experience in the Blues with them. Both have been playing and recording the Blues for over 40 years with each other and in other Blues bands. In 2015 they went to Memphis to represent BC at the IBC’s in the Band Category with Uncle Wiggly’s Hot Shoes Blues Band and are excited to be returning to Memphis to compete this year in the Solo Duo category as The Blue Hearts. This format allows them to get back to the real roots of the Blues with just Guitar and Vocals. Mark and Hank write and perform their own songs and stay true to the Blues. If you get out to any of the live music venues here in Calgary then you have likely had the good fortune to enjoy Johns talents and skills. Dating back to The King Eddy days this man is always held in highest regard from many of his peers and fans alike. As a local professional musician these days John’s schedule is normally kept filled these days as solo gigs or with his band John Rutherford and The Big Blues Trio. 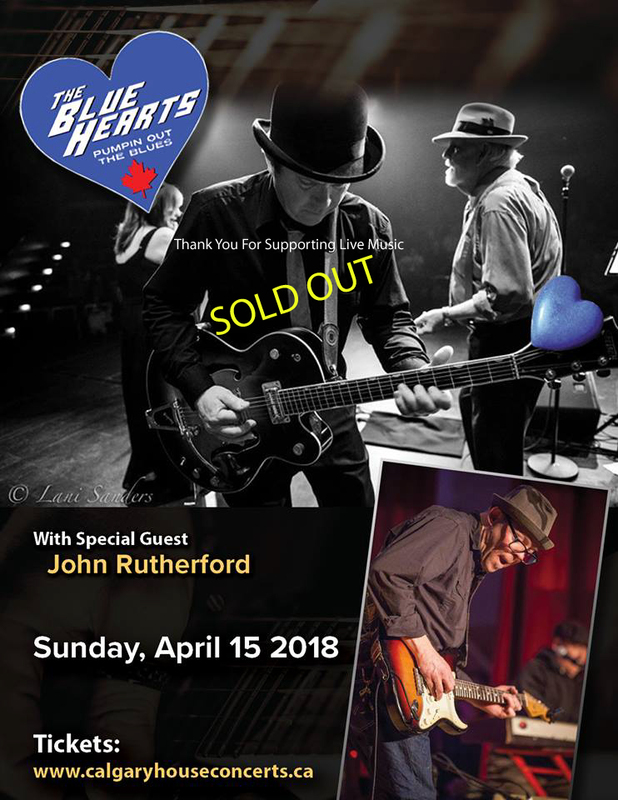 April 15th will be a real treat to see John perform up close and personal between his other stage shows here in Calgary at The Blues Can or The Ironwood or Mikey’s on 12th… need I say any more other than see you April 15!